In three branching stories, friends become foes, foes become friends, and based on your choices, multiple endings can be unlocked! LOS ANGELES, CA., JANUARY 17, 2019 - It's time for Fairize! The Nintendo Switch™ release of Fairy Fencer F™: Advent Dark Force is NOW AVAILABLE via Nintendo eShop™! The Nintendo Switch™ release will include all 25 DLC available in the original PlayStation®4 release. The European version will be released by Ghostlight. In celebration of the The game will also have a 20% launch discount off the $39.99 price for the first two weeks. Fairy Fencer F: Advent Dark Force might not be the most visually impressive game out there, but it does push a ton of characters on screen at once. How does the Switch hold up? Check out the framerate test above to find out! Players will need to be aware and strategize the following actions you'll need to make during battle: the Action Window, Attack, Wait, and Command. The move sets chosen will ultimately effect the overall turn order shown on the Action Window. Within the Command option, players will have five options to choose from. LOS ANGELES, CA., JANUARY 11, 2019 - We are excited to announce that the Nintendo eShop™ store page for Fairy Fencer F™: Advent Dark Force is now live! The game will be launching on the Nintendo Switch™ via Nintendo eShop™ on January 17, 2019! The Nintendo Switch™ release will include all 25 DLC available in the original PlayStation®4 release. The European version will be released by Ghostlight. The game will also have a 20% launch discount off the $39.99 price for the first two weeks. Alongside the Nintendo eShop™ store live date, we also have a brand-new batch of Fairize screenshots! When characters Fairize, they are transformed into a much stronger being where their attack and defense are drastically increased! When a character's Tension Gauge reaches a certain point, the color of the gauge will change to notify that the character can now Fairize. When your Tension Gauge gets too low during your Fairized state, your character will then go back to its normal state. 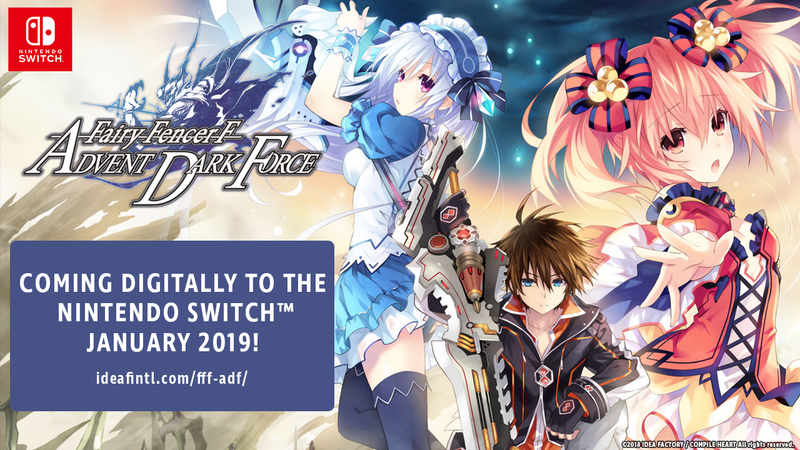 LOS ANGELES, CA., JANUARY 8, 2019 - We are excited to announce that Fairy Fencer F™: Advent Dark Force will be arriving on the Nintendo Switch™ via Nintendo eShop™ on January 17, 2019! The Nintendo eShop™ release will include all 25 DLC available in the original PlayStation®4 release. The European version will be released by Ghostlight. The game will also have a 20% launch discount off the $39.99 price for the first two weeks. Lastly, there is a new battle screenshot batch that showcases the different battle systems players will need to use and strategize for battle! Skills/Magic - Use your SP to use special attacks, heal HP, or other command buffs to help Fang and the gang through tough battles. Note that some skills require HP to use. Items - Utilize items wisely to heal HP/SP, remove status effects, and revive party members that are knocked out. Special - Each character possesses their own Special command with unique effects. "Fang's Serious Face" Special, increases his attack power by 1.5x, while "Pippin's Persuade," if successful, will make Pippin attempt to "negotiate" with the enemy and drive them away. Fairize - Once your Tension Gauge reaches a certain level, characters can Fairize, which transforms your characters into powerful beings! During their Fairize state, a character's attack and defense becomes much stronger. Players, however, must take caution of the Tension Gauge as characters will be forced out of the Fairize state once the gauge gets too low. LOS ANGELES, CA., DECEMBER 20, 2018 - Will you find all the furies to save the world, or will you bring about its destruction? We're excited to announce a brand-new batch of system screenshots for the upcoming January 2019 Nintendo Switch™ release of Fairy Fencer F™: Advent Dark Force! System screenshots include Fairies and their Resonance Effects, Godly Revival, Weapon Boost, and World Shaping. Fairy Fencer F™: Advent Dark Force will release digitally on the Nintendo eShop™ and will also include all 25 DLC available in the original PlayStation®4 release! The game will be available at a 20% DISCOUNT off the $39.99 price for the first two weeks of its launch! The European version will be released by Ghostlight. Resonance Effect allows fencers to raise their stats by imbuing the strength of a fairy into a Fury. By equipping your fairy as a Resonance Effect, you can increase a character's power or gain a variety of abilities! Godly Revival: In order to remove the Furies embedded within the Goddess and Vile God, you must undo their seals. Once you unleash a Fury and its ability is added to a fairy, you cannot reverse this action. So make sure you carefully analyze a sealed Fury's abilities. Once you extract a Fury, defensive devices will activate and a battle will initiate. Remember, choosing to undo seals between the Goddess and Vile God can change the game's ending! Weapon Boost: Freely customize your Furies! Boost your Furies' stats by utilizing Weapon Points (WP) that you earn in battle. Players can boost five different elements: Categories, Skills, Magic, Abilities, and Combos. Note that there are special conditions players will need to meet in addition to the WP requirement. World shaping is the process of stabbing a Fury into the ground and sending out an exploratory pulse.Thrusting a Fury into a "?" icon will let you discover entrances into new dungeons. Use this opportunity to stack different Fury effects on top of one another, allowing players to carry different effects into the dungeon! LOS ANGELES, CA., December 13, 2018 – Set your weapons to Fairize, because Fairy Fencer F™: Advent Dark Force comes to the Nintendo eShop™ January 2019! It will be available for the Nintendo Switch™ only in digital form, and includes all 25 DLC available in the original PlayStation®4 release. To celebrate, the game will also get a 20% discount off the $39.99 price for the first two weeks of launch. The European version will be released by Ghostlight.